What is Cash Register Express(by Heartland/pcAmerica)? 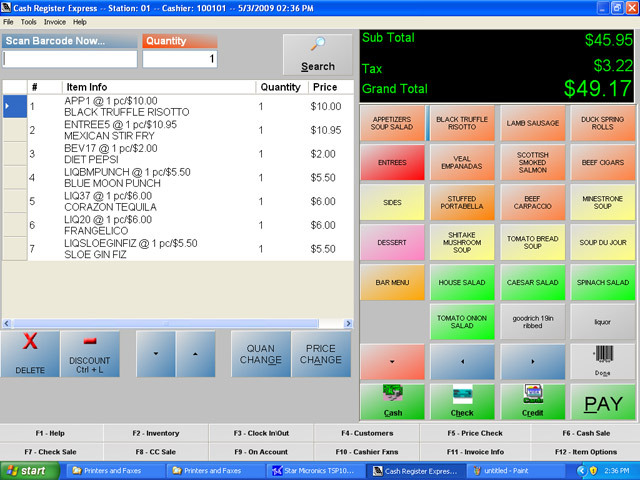 Cash register express is the POS software developed by Heartland/pcAmerica. Computerize your business with the #1 POS software on the market. Not sure if you should? Read why it's a good idea in our article, POS Software: Why use it?. pcAmerica Cash Register Express works EVERYWHERE! Why should you switch to pcAmerica Cash Register Express? Choosing the right pos software can be as important as choosing the right location for your business. Most store owners are shocked at how quickly a point of sale system will pay for itself. Often the newly computerized can't believe how much money they are saving just by better managing their inventory, ringing up sales quickly and accurately, and a decreasing theft. 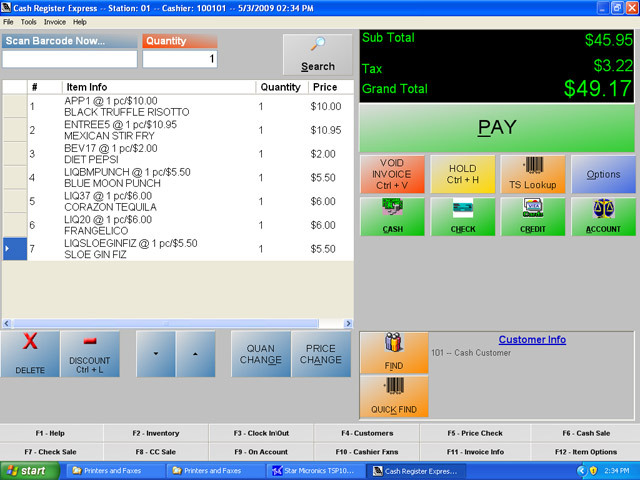 These and more features are made very simple by pcAmerica Cash Register Express. Download a test version of pcAmerica Cash Register Express now. Don't buy it unless your satisfied, please call (866) 468-5767 for a walkthrough. Did you know computerizing your store with a POS system costs $2.83 a day but you save $83.00 a day by eliminating employee theft and maximizing profits. Compared to other POS systems like Square POS, Clover POS etc. pcAmerica Cash Register Express (or CRE 2004) is a cost effective POS system to keep your inventory costs down, reduce theft, and make more money! pcAmerica Cash Register Express is designed to handle Multiple Clerks and Multiple Cash Drawers with ease! Processing credit cards can be done quickly and efficiently using an internet connection. If you do not have a merchant account you can apply for one here. Tracking sales and inventory, renting videos and equipment, creating membership accounts, look ups by category, and managing your store's books are just a few of the features of pcAmerica Cash Register Express 2004! Quick Tutorial: Learn how to use pcAmerica Cash Register Express' basic features with this online tutorial. Managing your stores resources and inventory can increase profits dramatically. From reducing inventory shrinkage to observing sales trends there are numerous ways that store owners or managers can find to add extra dollars to their cash drawers. A pos software's reporting abilities is often not discussed enough before purchasing a system and CRE's reporting abilities is one of the best in the business. This very essential part of the software gives you a very personalized look into your sales figures, inventory movement, and financial summaries. Does your store do video or tuxedo rental? If you have certain items that you rent out pcAmerica Cash Register Express can handle it. With a built in rental system you can set certain item as rentable or all your items depending on what kind of business you are running. It is user friendly and easy to manage. Rental Features: Detailed Tape Rental History, Family Account Memberships, Non-Video Sales, Detailed Customer History, easy setup, call to learn more. 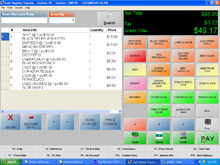 pcAmerica Cash Register Express is America's leading retail pos software solution. 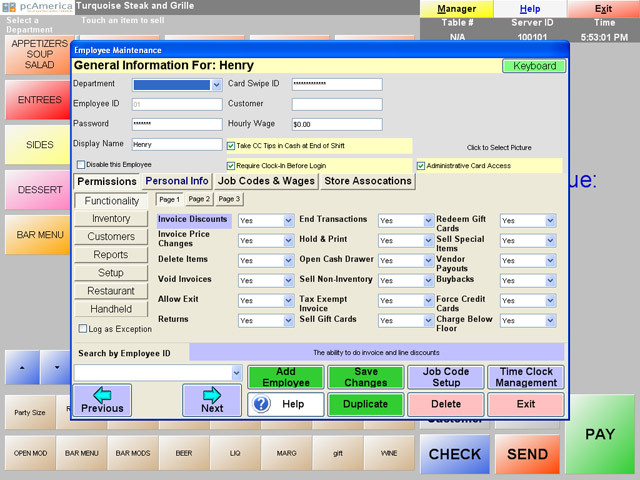 This acclaimed pos software has been in use for over ten years providing a computerized solution to thousands of retail stores. 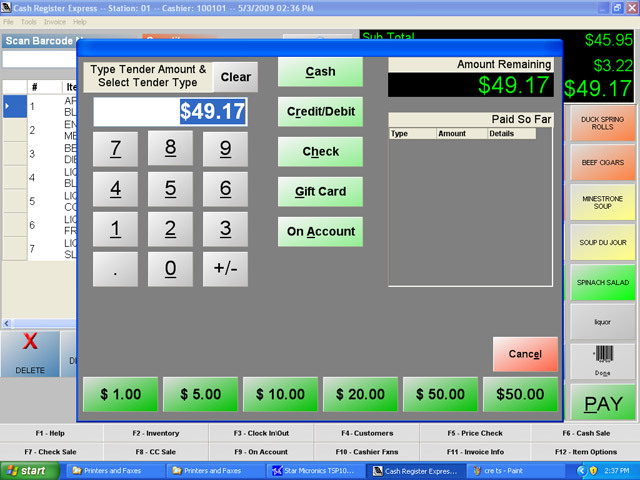 Call (866)468-5767 today for more information on pcAmerica Cash Register Express and other POS software needs. If you're asking, "How soon can I get my activation code?" the answer is seconds after you buy your license. You don't have to wait for a CD in the mail. The activation code will be emailed to you! 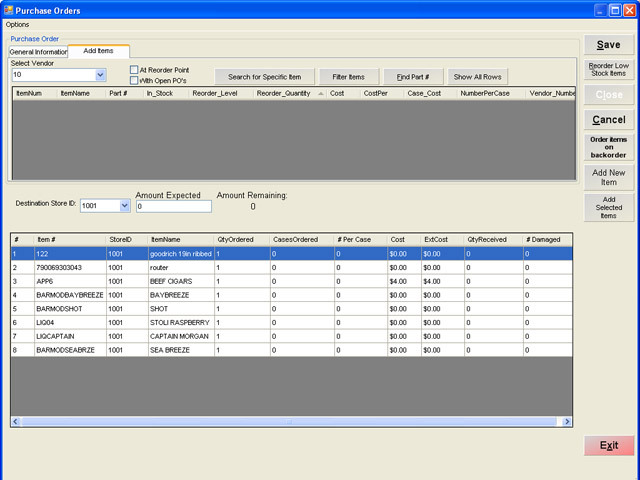 Get a full working copy of CRE to test out the #1 POS software on the market. Want to reset code for CRE/RPE? Fill out this CRE / RPE registration code reset form. pcAmerica Cash Register Express is now on version 12 - which includes new features like customer lookups, quickbooks compatability, flexible pricing, and more. For a full list of features, click here. Below are some hardware items that work exceptionally well with CRE. "Our CRE system is a tremendous improvement and probably saves in a weeks time 10 to 12 hours in expediting customer checkout time. 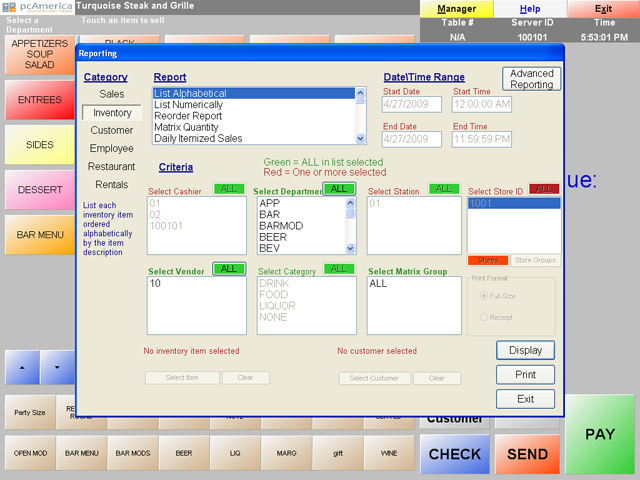 We also scan our deliveries in at the register and with the UPC codes provided by the vendors it takes a fraction of time over our previous manual system checking in an order"
pcAmerica Cash Register Express is the POS software package made for store owners NOT a Computer Whiz! International Point of Sale brings you the best in POS hardware and software, all at an affordable price. Any type of retail store can benefit from our wide selection of products designed to make your business more profitable. 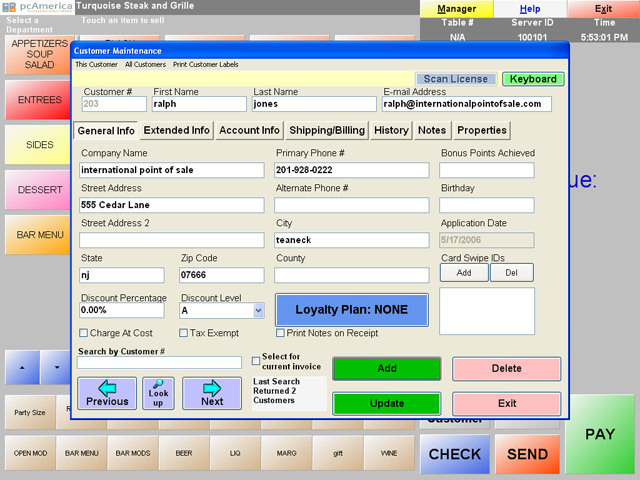 When you computerize with IntlPOS, you get a cash register plus inventory tracking for complete control over your retail business. Our best bundle with Cash Register is the top of the line HP Bundle. With this bundle you have top of the line hardware designed to work in a retail environment. Download our e-book here to learn how POS technology can support your strategy to build customer loyalty.